Wilmington, Del. (June 29, 2017) – Divisions Upon a Ground will be on view in the Mezzanine Gallery from July 7-28, 2017. Please note that there will not be an opening reception this month. The exhibit title, inspired by Renaissance music, refers to elaborations and enrichments on a simple theme. In this body of work, Bard uses a technique that involves long exposures and movement to achieve flowing, ephemeral landscape images. 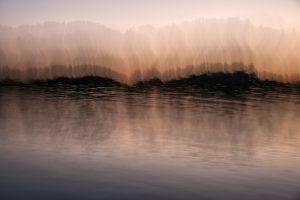 She likens the process to painting with light on a sensor where rhythmic and dancing textures are created by the camera’s motion and long exposure. Bard sets up the composition on location and continues the “painting” in the development phase. Her goal is to capture images that provide the viewer an impression of time and space. Learn more about Bard with our YouTube Meet the Artist video series.